Cal State Los Angeles students Neyda Umana and Edgar Chavez had organized against a possible tuition hike. Now their wish has come true. Trustees of the 23-campus California State University system postponed any vote on a possible tuition hike until May but warned that a $228 increase was likely, along with cuts in course offerings and enrollment, if the Legislature doesn’t substantially increase funding. Much of the discussion at the trustees’ meeting in Long Beach on Tuesday focused on Gov. Jerry Brown’s recent proposal to increase state general revenues for Cal State by $92 million next year. That is a 3 percent increase in funding but $171 million less than the university system says it needs to pay for salaries, building maintenance, programs to improve graduation rates and other costs. The system’s operating budget this year is $6.1 billion, half of which comes from the state. Like their peers at the University of California, the Cal State trustees and administrators said they would spend the next four months lobbying the Legislature and the governor for extra money. 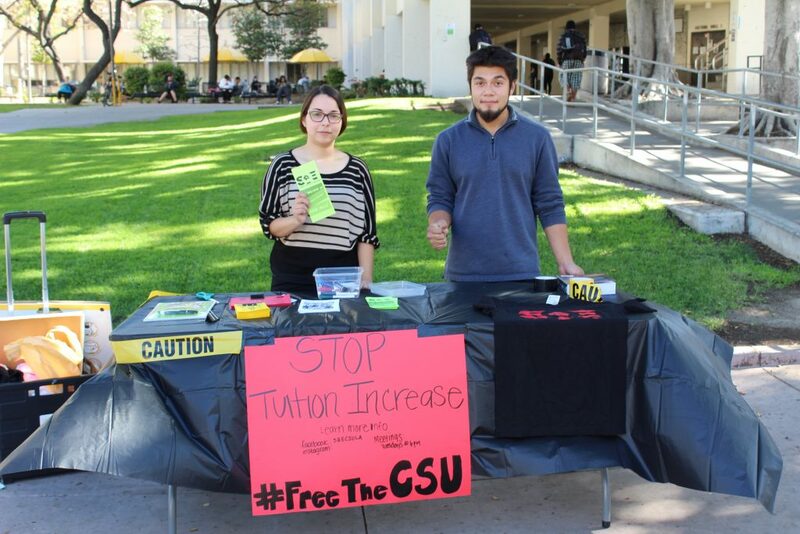 In hopes of changing minds in Sacramento, Cal State officials said they wouldn’t vote on higher tuition levels in March as planned and would wait until May. At the same time, they said they would prepare to enact the 3.9 percent tuition raise to $5,970 a year for California undergraduates, as well as possible reductions in courses and staffing. The possible spending cuts and tuition increase “are not strategies we want to pursue. They are not desirable but they may be necessary in order to balance our budget,” said Steven Relyea, the Cal State system’s executive vice chancellor and chief financial officer. Extended budget negotiations among Gov. Brown, legislators and higher education are nothing new. But as the state recovered from the 2008 economic collapse, agreements for extra state funding in exchange for tuition freezes held for five years — until last year. Then tuition rose $270, or about 5 percent at Cal State, and $336 or 2.7 percent at UC. This year, in his final year in office, Brown has been strongly vocal in opposing tuition increases and in pushing for reforms, such as more online classes, that could reduce costs. Asked for a reaction, a spokesman for the governor forwarded a copy of Brown’s recent comments that higher education must learn to “live within their means” and be more efficient. The governor’s budget noted that state support for UC and Cal State has grown by nearly $2 billion since 2012-13 and that much of last year’s tuition increase was covered by Cal Grants, which came out of the general funds as well. UC was expected last week to raise 2018-19 tuition and system wide fees by $342, to $12,972 for California undergraduates, but also decided to postpone a decision until May in hopes of more state dollars.